Actor George Clooney created quite a stir in a Milan courtroom Friday, appearing to testify in a fraud trial in which three people are accused of using his name to set up a fashion label. "I came here because I believe in the judicial system and because there were people using my name to take advantage of people," Clooney told the court. The defendants -- Vincenzo Cannalire, Francesco Galdelli and Vanja Goffi -- have been accused of fraud, forgery and possession of stolen goods. 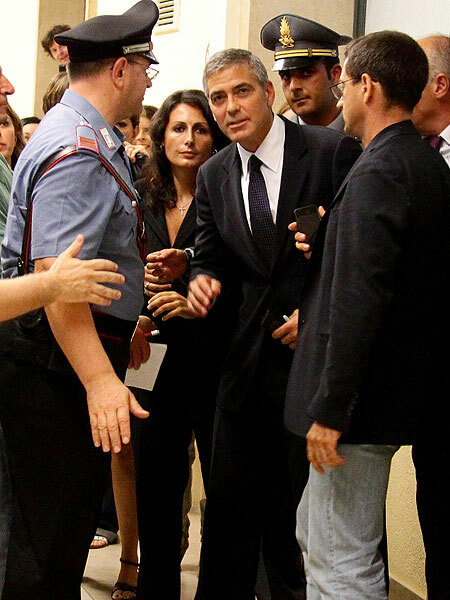 At the hearing, Clooney viewed several pictures showing him alongside the defendants, and deemed they were fake. But he did turn to one of the defendants, Cannalire, smile and say, "Good work. You should be proud of yourself." Clooney also said his signature had been illegally copied on several documents including a license for a fashion line labeled "George Clooney." See photos of Clooney and his gorgeous Italian GF Elisabetta_Canalis! After his 90-minute testimony, Judge Pietro Caccialanza thanked the actor and said the session "has lasted as long as a movie." Afterwards, Clooney told Reuters, "It was not too tough. It's easy when you can prove that you are absolutely right." Meanwhile, fans swarmed outside the courthouse, eager to catch a glimpse of the matinee idol. As he made his way through the crowd, the "Ocean's Eleven" star quipped, "Don't crush my lawyers!" Watch video of the fan reactions!